No visit to New York City is complete without taking in a Broadway show and a stop into a Jewish deli, or getting a slice to go from Famous Original Ray’s Pizza. Visiting Philadelphia? You have to try a real cheesesteak sandwich and at least drive by the Liberty Bell. And Nashville, with its hot chicken, is no different. Many of the hundreds of thousands of visitors who flock to the South’s new “It” city each year come for CMA Fest, a stroll through Broadway’s honky tonks and, of course, to find the best Nashville Hot Chicken. You’ve certainly heard of Nashville Hot Chicken. You’ve probably even eaten Nashville Hot Chicken, and quite possibly not even in Nashville. The city’s namesake signature food dish has popped up on menus across the country and even beyond our nation’s borders in places as far away as Australia. There are dozens of restaurants in Music City offering hot chicken, there’s a Nashville Hot Chicken Coalition, a Hot Chicken Festival, and in true Nashville fashion, there’s even a Hot Chicken song. But how in the world did hot chicken swoop in and overshadow more obvious Nashville edible stereotypes like barbecue or potato salad? Even pancakes have made a run at Nashville’s trademark food. (Which is evidenced by the lines that always wrap around the building at Hillsboro Village’s Pancake Pantry). The legend behind the origination of Nashville’s Hot Chicken goes further back than you might think and is far spicier than the chicken itself. You can read the legend of how hot chicken came to be all over the internet, but we decided to go straight to the source. We chatted with André Prince Jeffries, the great-niece of Thornton Prince. And who is Thornton Prince? He’s the man who inspired the very first hot chicken recipe. Ms. André now runs the family business, Prince’s Hot Chicken Shack, which has two locations in Nashville and is widely known by the locals as the birthplace of the city’s namesake hot bird. She goes on to say that after a late night of doing God only knows what, Thornton stumbled home late (or maybe even early the next morning). The woman who was at home waiting on him decided to get her revenge through his stomach. She mixed up the hottest possible concoction of fried chicken spice she could dream up, hoping to set him on fire from the inside out. Legend has it her efforts backfired. Thornton dug into the chicken and loved it, so much so that somewhere around 1936 (Ms. André thinks it was earlier than that), Thornton opened a restaurant he called the BBQ Chicken Shack that served his specialty: hot chicken. Originally, the restaurant was only open from 6 p.m. to midnight during the week and until 4 a.m. on the weekend. This is a tradition that Ms. André has maintained, even though she decided to change the name along the way to Prince’s Hot Chicken – since, she said, they never served barbecue. So, Thornton Prince began feeding hordes of people really spicy chicken in the middle of the night some 80+ years ago from a recipe cooked up by a scorned lover. Not necessarily the makings for a history-making food that comes to completely define a Southern city. In fact, nobody is more surprised at the food’s popularity today than André herself. Enter former Nashville Mayor, Bill Purcell. A longtime fan of Prince’s Hot Chicken, back in the late ’90s, Purcell decided to publicly declare his love for Prince’s and officially put hot chicken on the map with the big red push pin smack dab in the middle of Nashville. In 1996, he drafted an official State of Tennessee House of Representatives declaration designating Prince’s Hot Chicken as The Best Restaurant in Tennessee. The weathered document still hangs framed in the Nashville location. In 2007, Purcell created the first Nashville Hot Chicken Festival, and the rest, as they say, is history. Nate Karlin moved to Nashville from Kansas nearly a decade ago, and because he has always been a lover of hot sauces and spices, he found himself a big fan of Nashville’s take on hot chicken. Nate and his family recently relocated to Dallas, and after a Google search, he uncovered that Nashville-based Helen’s Hot Chicken has a location in Lewisville, Texas, which is about 30 minutes away from Dallas. “I haven’t made it out there yet, but it’s definitely on my to-do list. I’ve told my group of guy friends about it, so I hope to bring them with sometime,” he says. Party Fowl is a relative newcomer to the Nashville market and serves up their own version of hot chicken. 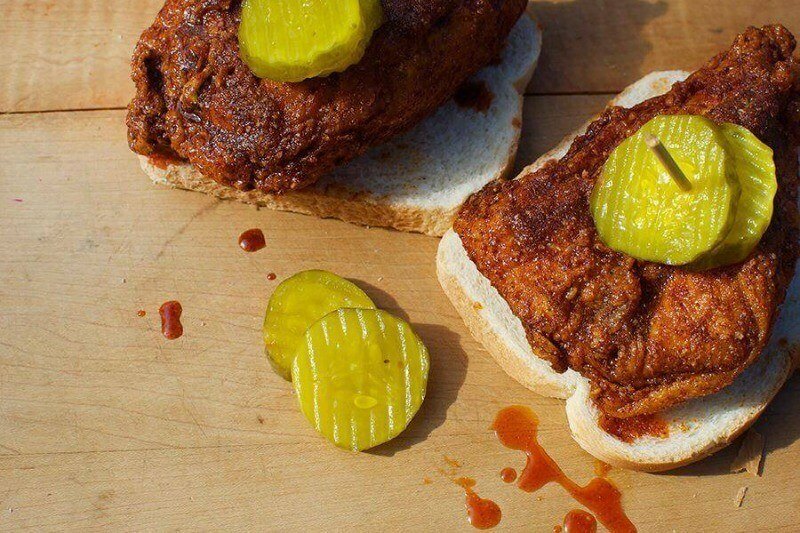 Executive Chef Bart Pickens says Nashville Hot Chicken was developed as a weapon that turned into an endorphin kick that is redefining Nashville’s culinary presence. He says his recipe is definitely a nod to those who came before him, with an effort to bring something original to Party Fowl to the table. Learn fascinating Southern stories — subscribe to StyleBlueprint for your best “me moment” of your day!